Season beef with salt and pepper. Set aside. Melt the butter in a large skillet over medium heat. Cook onions with sugar 20 minutes or until deep golden brown and caramelized, stirring frequently. Stir in beef broth and cook an additional 3 minutes or so until reduced. In the meantime, prepare top sirloin to desired doneness on grill or in grill pan. Prepare garlic toast per package directions. To serve, place 2 sliced of garlic toast on each plate. Top with one 5 ounce cut of top sirloin. Top with half of onions. Repeat with remaining garlic toast, beef and onions. Serve immediately. 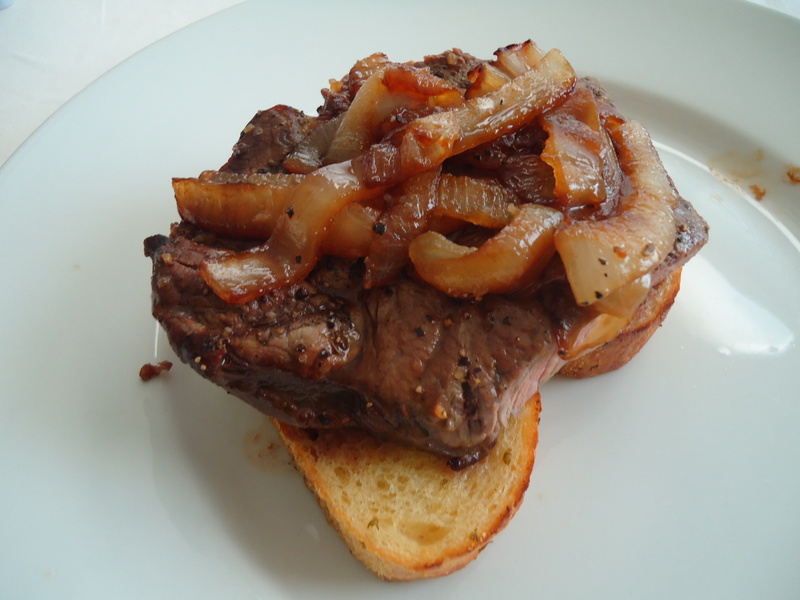 This entry was posted in Beef, Entrees and tagged Beef, Garlic Toast, Grilling, meat, onions, steak, Top Sirloin. Bookmark the permalink.